For the Container Butterfly Garden, it's beginning to look like the need to raise cats in a controlled environment. "Controlled environment? Pray tell, what do you mean?" That means collecting monarch eggs and possibly 1st instar cats from the garden for raising in nursery containers. 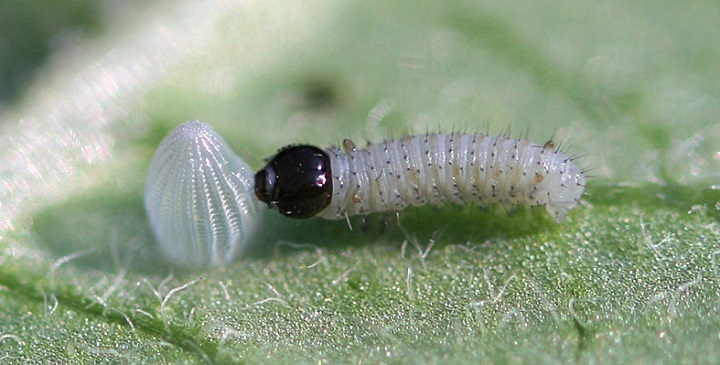 Eggs and 1st instar only because they are the stages least likely to be infected by parasites. 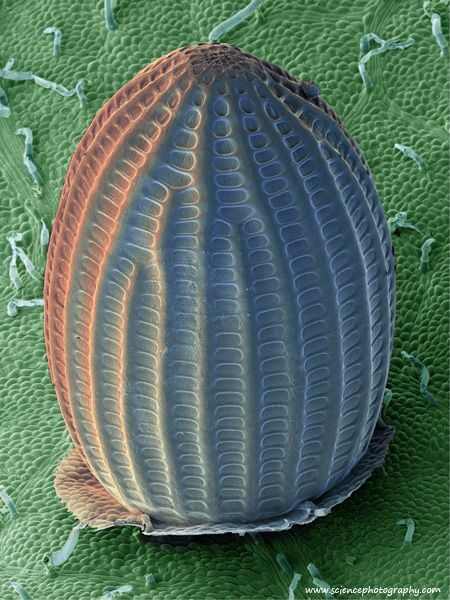 Scanning electron photograph of a monarch butterfly egg. Newly hatched monarch caterpillar (1st instar) feeding on its own shell for the protein boost. The incidence of parasitism in the container garden is getting out of hand. With the threat of Oe continuously hanging over the caterpillars' heads plus the rest of the predator/parasite crew potential threats, now parasitic tachinid flies have become unbearable. 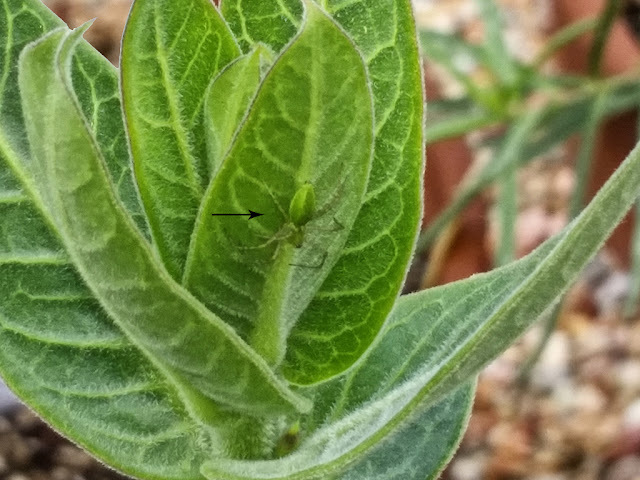 My little green spider dude taking up residence on Gomphocarpus cancellatus. I ordered two Gomphocarpus cancellatus plants online from Annie's Annuals and Perennials. Annie's still lists it as Asclepias cancellata, it's old taxonomic name. From what I've read, G. cancellatus should adapt well to SoCal gardens and could prove to be quite a substantive source of monarch caterpillar food. As the season progresses, I'll update on its merits, or lack thereof. One of many species of tachinid flies. The one above looks most like those in the container garden. 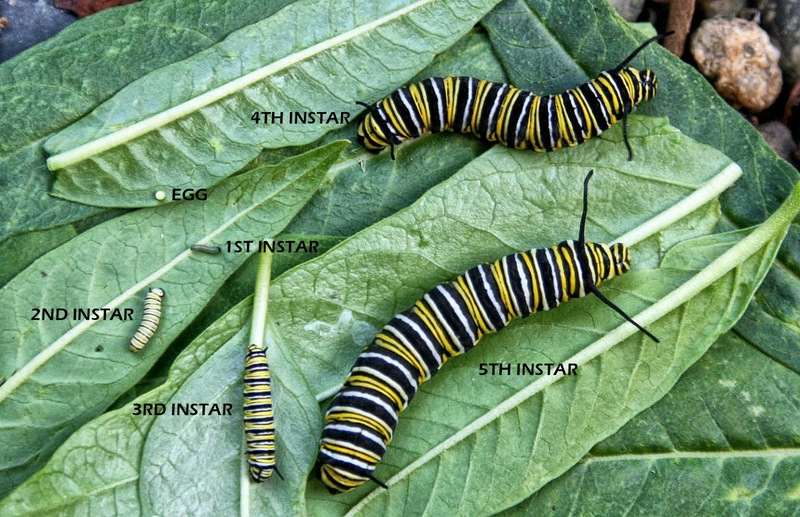 Back in mid March, I could easily count a dozen + cats in various stages of instars. Within two weeks I saw none except for one sorry looking, lone, 3rd instar individual. Within six inches of the cat perched a tachinid fly staring directly at it. I took the little cat inside, put him in a rearing container with some fresh food, and within a day it was dead from what I believe was a parasite, most likely a tachinid. I went back in the garden, promptly scouring every bit of milkweed underleaf surface scrounging for eggs and small cats. 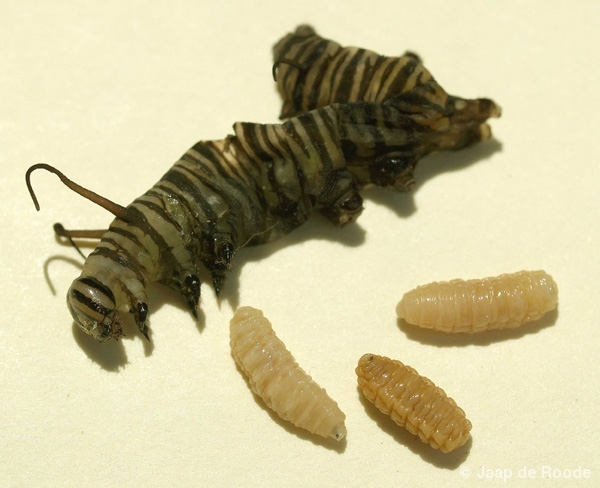 Found three eggs and one tiny 1st instar cat that were placed in rearing boxes I made. Unfortunately, I lost the wee little cat when trying to transfer it to a new box. It dropped onto a design-rich oriental carpet, where it immediately was lost to the relative chaos of the rug's surface. 1st instars are so small, one just about needs a magnifying glass to view them properly. Even with my reading glasses, it was hard to pick him out sitting on a white paper towel that lined his first box. I have not seen one Monarch here in the container garden -- or any type of butterfly for that matter -- in the past few weeks. I check for eggs and young cats a couple of times per week on the milkweeds, but have yet to find anything new. Could it be attributed to just a lull in visitors, or can they sense the presence of tachinid flies close by, therefor avoiding the inherent dangers? I have no clue.